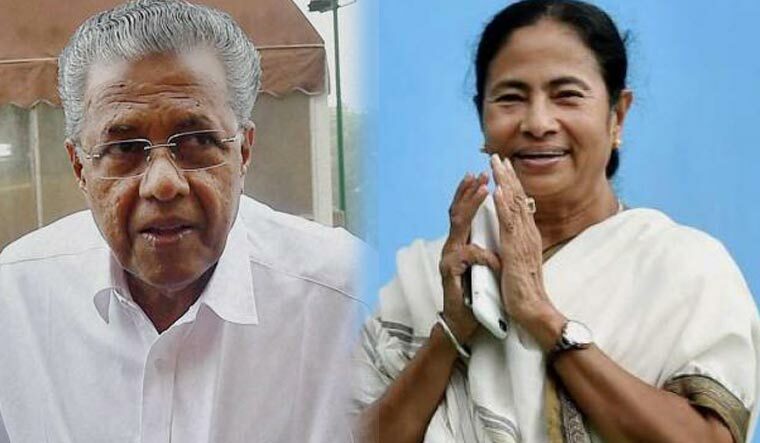 In what could be seen as a strong political message to the non-NDA parties, West Bengal Chief Minister and Trinamool Congress supremo Mamata Banerjee on Thursday wished Kerala Chief Minister Pinarayi Vijayn on his birthday. “Birthday greetings to @CMOKerala @vijayanpinarayi Pinarayi Vijayan,” Mamata wrote on Twitter. Pinarayi Vijayan turned 74 on Thursday. Though in all the official records, including in the election affidavit, his birthday is recorded as March 21, 1944, he had revealed his real date of birth at a press meet just a day before his swearing-in as the chief minister in 2016. Mamata Banerjee's tweet has taken political observers by surprise given the hostility between the Trinamool Congress and Vijayan's Communist Party of India (Marxist) in West Bengal. She has been campaigning in the national level to form an anti-BJP coalition to take on the Narendra Modi government in the 2019 Lok Sabha elections. It is believed that she hopes to get the CPI(M) on board to form a grand alliance to take on the NDA. The Trinamool chief was among the first to congratulate JD(S) and Congress on coming together to keep the saffron party out of power in Karnataka. Last month, Mamata Banerjee had visited ailing CPI(M) leader Buddhadeb Bhattacharjee in Kolkata. This was the third such meeting of the Banerjee and Bhattacharjee since the Communist chief minister demitted office in 2011.